The donation page for the 100 Poem Challenge closes in just under three days, and I'm thrilled that so far we've raised over £3000 for The Book Bus! I'll be handwriting the poems on postcards after that, and the limited edition poetry pamphlets will be printed shortly. The cover for the pamphlet has been designed by the wonderful and generous Leo Nickolls - I love it and I hope you do, too. You've still got a couple of days to buy the poetry collection if you'd like to (it'll never be printed again). Click here for more info, and you can read all of the 100 poems on this blog, just click here and scroll down. Evening, folks. It's 11:48pm and I just posted the last poem for the 100 Poem Challenge - phewf! You can read all of the poems on this blog below. Thanks so much to everyone who has been reading, spreading the word on Twitter, offering virtual cups of tea and donating over on Indiegogo. You've been wonderful. 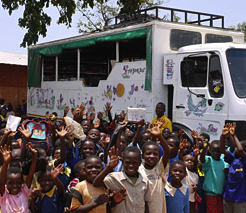 Remember, all donations go to the FABULOUS Book Bus, who send mobile libraries out to rural communities in Malawi, Zambia and Ecuador, helping children learn how to read and tell their own stories. Check out their Twitter feed to see what they've been up to recently. They are some of the best humans. The donation page will be up for another 16 days over here - as I type this we're nearly at £2500! 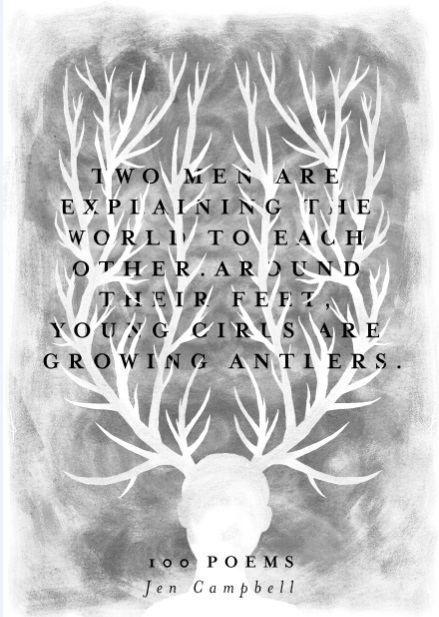 - perks are up for grabs including handwritten poems on postcards and limited edition poetry pamphlets of all 100 poems. However many we sell before the donation page closes will be the number that are printed (they won't be printed again). The fabulous Leo Nickolls is very generously making a cover for the pamphlet and it'll be posted out to all who buy one a few weeks after the Indiegogo page closes, numbered and signed. Stories, stories, stories. Stories for everyone. Excuse me, I'm going to go put the kettle on. "Are we at the end?" "I think so. Take a look." "What happens at the end?" "I guess we do what we always do." "Pick up another book and carry on." How To Reach The End. 2. Don't take a map. 5. Count slowly to 100. We turn the weakest part of us into birds. And the strongest parts, too. We find the world makes more sense that way. "Any final requests?" you ask. "I am speaking to you." "Ok. Sorry. Once upon a time..."
"I'm not dancing. I'm just standing here." "There isn't any music, either." "I know. Will you dance with me?" we leave everything else to chance. Instructions on How to Fall Sleep. 1. Do not think about sleep. 2. I said don't think about it. 3. You're your own worst enemy, you know. 5. Now focus on me. and see where the stories go. "The bird song is louder here." "Let's climb trees today," you say. Google shows me the end of the word instead." - a little tale from long ago when our world was filled with magic. I think I'm going to sleep a while, you say. That's ok, I say. I'll keep watch. Often I find myself falling in love with stories from different centuries. Love is problematic like that. what books mean to me. Before you leave, you ask me to cut holes in your pockets. If I go to the caves there might be something in the darkness. If I don't go to the caves, the darkness will follow me somewhere else. If I never leave this room, and no one else sees me, do I really exist? If we never leave this planet and no other life form sees us, do we really exist? because you'd be looking at the world through some kind of underwater. Let's go on a journey and not take a map because that's the best way to do journeys. But maybe I'll draw the outline of an island on the back of your hand while you make the sandwiches so that we can keep an eye out to sea in case there's something nearby which looks just like it - somewhere we've thought of in our heads before, somewhere which would be fun to see. A note in the library. Surely we have discovered and named everything now? you say. Surely this is all there is. But why would that be any fun? I have to leave my mouth behind. trying to grow her wings. because I've never met the poets who wrote them. We tell each other stories and our bodies change. We're making room for all the words, for all the possible endings. Dear Jack and Jill, this is an important message, please do not hang up. We have been notified that you may have suffered a personal injury or had an accident at work in the past seven years and due to recent government changes you may be able to claim compensation. Please press one if you would like to proceed or star for more options. My body is a country. Two men are explaining the world to each other. Around their feet, young girls are growing antlers. There's that story of us where we were standing in an open field in the rain and I turned around and you were digging at the earth with a spade I didn't realise you had brought with you. "What are you doing?" I'd asked; "I'm digging," you said -"But what are you digging for?" I asked, the rain in my eyes and my clothes turning to skin, and you said: "I'm looking for the quiet space." Close your eyes and think of a number. No. You're thinking of the wrong number. Step outside your house and walk in a straight line as far as you can go. If objects and people don't move out of your way, write their names down. This list might prove useful in the future. "Where do you go, when you die?" "Do you know where you are now?" Write a poem about a word you can't pronounce properly. Constantly spell it incorrectly, on purpose. Write a haiku that refuses to conform to being a haiku. rip it up into tiny pieces and bury it in the garden. Don't let the neighbours see. Write the life history of an imaginary goldfish. Read the poem to your goldfish. "Can you outline my body?" "Can you outline my body, please?" "Maybe shine a light out behind it and see if I'm see-through." "I don't think you're see-through." "I think parts of me are. I just want to check." You have written to us because you want to know more about ______ . There are many ways to understand ______ . It might be helpful to think of it as ______ . Or perhaps as ______ . ______ has written many interesting essays on the subject. Perhaps you can find them at your local library or online. We recommend, however, that you do not dwell on this matter. We hope this has been of assistance. Please do not hesitate to contact us again. Caitlin is mostly water but she feels like a cricket pitch. I noticed that the sea wasn't doing much this morning, which is to say that it was existing. However, this afternoon you began swimming in it - which meant it was definitely alive. a. After you leave I try to work out what is conscious. b. I feel guilty moving furniture. I can't bear to turn off lamps. c. I think maybe we created something. Not someone, but something. d. What does that mean? Where does it go? "How many books are there in the world?" "We could make a planet out of those," you said. I search Google for Google's most asked questions. The most asked question last year was: 'What is love?" so I'm not sure that it counts. Words no longer make sense to me, I said. I've looked at them too long. Ah, you said. Good. Now I'll get more sense from you. I'll be right back, you said. But I'm telling you stories! I pull out the instructions on how to breathe underwater. They recommend that I think very carefully about what I am doing. They recommend that I trace my family tree to search for signs of magic. They recommend I don't attempt this if I am in any way allergic to water. I'm not exactly sure what they want me to do. The road licked our toes and the sky disappeared. We're halfway there you said peering over your shoulder. Halfway where? I asked shaking off feathers. I'm not quite sure you said but I spy the sea. "Why does it always have to be a forest?" "Why do the forests always swallow the stories?" "Shh. Keep your voice down." I keep a notebook by my bed for the unfinished stories. i. The bear in the cave that once ate my heart. ii. The never-ending bookcase stretching into the sea. iii. My skin rusting with bells that the whole world can hear. There's that story about a princess who locked herself in a tower. "Stop calling me beautiful!" she yelled. "It's such an ugly word." "Don't you worry that someone might have told your story first?" "Good. Now get on with it, quickly, before it becomes a stampede." and there's traffic in our limbs. I am a work in translation. 1. The world is full of cannibals. 3. Stay away from the trees. "We can do that right now," you grinned. and lock the front door." and that person has to read it, underlining passages they like. and pull people together through the pages of a book. "If you could live in any world, which world would you choose?" "One where you didn't ask me so many questions." "Very funny," I said. "But which would you choose?" on this scrap piece of paper so no one else can see." that no one cleans it properly and now there's food in my hair. As much as I like darkness, that doesn't seem good. become a living electric current lying on the kitchen floor. But I'm aware that this is probably not a great idea. or the half-reflection of your dirty computer screen. Count again tomorrow. Then come back. Which day did you see yourself more? .... did you hear that? and falling from the sky. and whether I am trapped inside or someone's breaking in. 1. You are only as tall as the tale you are telling. 2. Don't talk to animals. Recently I've been having dreams about versions of the afterlife. A boat full of clockwork mothers. A courtroom full of owls. "What do you think it means?" I ask. "It means you're not dead yet." she was definitely a human. Don't ask us how we know. half buried in the snow. Her wing span was impressive. See, this feather's from her mother. She's dead now, the girl, sadly. No, you can't see her right now. You bury yourself in books to see if you exist somewhere else. To see if someone imagined you before your mother birthed you. To see if you tumbled out of a storybook and straight into her womb. "Can you tell me why you like short stories?" "This isn't a short story." "I know, but can you tell me why you like them?" to pretend that we are like you. It's for your own good, you know. Trust me. You'd never believe in magic if you could actually see it. Please sit down and make yourself comfortable. 3. Would you say that you are good at existing? 4. If not, how you could exist better? 5. Do you think that, in the context of existing, others assist you? 6. Does this make you exist more? 7. Sum up, please, in three words, your total existence. 8. I’m sorry, could you repeat that? 9. I’m sorry - are you there? Let me tell you things. There's that story of the girl with red hair who ran into the woods and never came out again and there's that story of the girl with red hair who found the man who wrote the story about the girl with red hair who ran into the woods and never came out again, and she marched him into the woods with her eyes all ablaze. Then there's the story of the story, and there's no arguing with that. because that’s what’s happening right now. We’re cheating geography, you and me. We are existing in two places. Be the best teller you can be. we hang x-rays on the walls. what to do with all of that black, non-empty space. I can’t possibly explore it all. and I guess that that’s ok.
An apology for a genetic mutation of poetry. The world still makes sense with errors, you know. them home - so they can have the room to breathe. and I'm not sure you had the number to reach me here anyway. on a cliff top, like some form of urban bird. “We swallow them,” you say, your hair sticking to the sweet. Most tales start out at sea. Turn your head and show me things. They don’t have to be whole. I like the half-lit half-light. 1. Teach yourself to navigate. Hey. Why do you sleep like that? Like you have the anatomy of a windswept world. Drawing maps inside your head. squinting, even though you're standing right in front of it. "I think it's broken," you say. You nudge it in the ribs. It might be about to do something." just to hear the stories. There are few things in life I am sure of. I am sure that books have the answer. I am sure that lightbulbs on string are dancing. I am sure that well-lit basements hold the songs of all of us. If I remembered it, it would be the ridiculous blue of Panda Pops at school discos. The kind that stains your teeth. And fills your words with sugar. 2. My parents were wrong. 3. We need a new Eve. 4. My soul is a blackbird. The words seem different here. Thank you so much for your donations so far - you're all wonderful. If you haven't donated and you want to, you can do so over here. Perks are up for grabs, such as handwritten poems on postcards and limited edition poetry pamphlets. If you're not able to donate, it would be wonderful it you could share the link. The Book Bus do amazing work and it would be lovely to raise as much money for them as possible. I'm going to be posting the 100 poems on this blog over the next two days (finishing by midnight Wednesday 7th October). Hello, folks! On 6th-7th October 2015 I'm going to be writing 100 poems in 48 hours to raise money for The Book Bus, a wonderful charity that sends mobile libraries to communities in various places across Africa, Asia and South America to help children learn to read, provide teaching materials and create school libraries. On the 6th-7th I'll be posting the poems on this blog as I write them. Before then, if you'd like to, please tweet me tag words using the hashtag #100PoemChallenge - I'll use some of these as titles of poems or to spark off ideas when the time comes. I've set up an Indiegogo page over here to accept donations. Any amount that you could donate would be very much appreciated: £1, £2, whatever you can spare. I've set the goal at £1000 but I would love to raise as much money as possible - as I'm sure you'll agree: stories are a huge part of what makes us who we are, and reading is a skill that should be available to every child. There are also two perks that you can purchase: a handwritten poem on a postcard at £5 (I'll be handwriting each of the 100 poems on postcards after the event) and a limited edition poetry pamphlet of all of the poems for £10. Both of these can be shipped to anywhere in the world. All proceeds go to The Book Bus. The Book Bus supports schools by providing mobile library facilities and volunteer story-tellers to help children become confident and literate readers for life. Working mainly with rural schools in Zambia, Malawi, India and Ecuador, our volunteer crew divide huge classes into small groups and inspire the children to read by personalizing the reading experience through story-telling, assisted reading practice and creative arts. This simple and effective support is sustained by provision of books and resources to each school library. Each Book Bus and its volunteer crew supports a cluster of five schools for up to three months. We make weekly visits to these schools working with up to 800 children from the cluster. The project finishes with an end of term party and opening of a new school library. Jen Campbell is the Sunday Times bestselling author of the ‘Weird Things Customers Say in Bookshops’ series and ‘The Bookshop Book.’ She’s also an award-winning poet and short story writer; her poetry pamphlet 'The Hungry Ghost Festival' is published by The Rialto, and she runs a Youtube channel over at www.youtube.com/jenvcampbell where she discusses all things books. You can read more of her poetry here. Jen will be writing 100 poems in 48 hours (6th-7th October 2015) to raise money for The Book Bus - a charity funding mobile libraries in rural communities across Africa, Asia, and South America, helping children learn to read. The poems will be posted on this blog as she writes them, she'll be vlogging on her Youtube channel as she goes and you can donate money to support The Book Bus over at this Indiegogo page here, where you can also buy limited edition pamphlets of the 100 poems and handwritten poems on postcards. All proceeds go to The Book Bus.